We have recently been reviewing a range of different products from Great Gizmos as part of their christmas blogger project. You can read our review here. 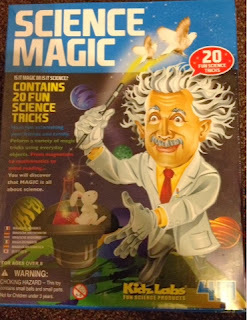 As a special treat for you guys I have a Science Magic kit by 4M to giveaway to one lucky reader. But hurry the competition will only run for two weeks so I can hopefully get the prize to the winner before Christmas. This kit from 4M contains 20 fun science tricks to wow everyone. It's not your average science kit, its almost magic. It shows you how to perform a variety of magic tricks using everyday objects. From magnesium to mathematics to mind reading. You will discover magic is all about science. Open to UK only. The competition will end 11/12/2013 at 12am. The blog owner will choose the winner through the rafflecopter form (which uses random.org) The winner will be notified by email and displayed on the widget. The winner will then have 10 days to claim their prize. If the winner hasn't claimed their prize after 10 days another winner will be drawn. No alternative prize will be offered. The prize is being given courtesy of Great Gizmos. No payment has been received for running this giveaway. I would like to learn to make things appear, like any things i want! how to magic a rabbit out of a hat! I would love to learn how to chop my husband in half!Im not that worried about making him whole again,just the first bit!! let me see.... I would like the ability to go invisible just think it would be very enlightening. anything that makes the kids think i'm cool!! How to make the dirty dishes magically clean themselves! how to make housework disappear! How to make things appear and disappear at will. How to saw someone in half. To saw my husband in half and i wouldnt even mind if the trick went wrong! the saw in half trick - the most famous trick of all time! I'd like to learn a really impressive mind-reading trick! How to saw someone in half - great trick. sawing a person in half ! We were at a kid party last week - there was a great magician and his most popular trick was when he got the birthday girl to throw eggs, flour and sugar into his hat and a cake appeared. I'm a terrible baker so that would certainly be a useful trick to learn! I'd love to magic a rabbit out of a hat! How to make my washing disappear! would love to make the sofa levitate - much easier to reach the toys stuck under it! how they cut someone in half! How to make myself invisible. Imagine what you could get up to! I would love to make money appear! invisibility-- everyone wants to be a fly on the wall just once. I'd love to know how to keep kids rooms tidy - Now THAT is magic!